What is it about chili that makes it the perfect cold weather food? I had this prepped in the crock pot last week on the coldest day we’ve had thus far (although I know it will get much worse and I will beg for a 2 degree day in a couple of months) and when I stepped in from the blustery cold and remembered that there was hot chili ready to eat I could not have been more thrilled. I never, ever follow a recipe when I make chili and I even struggled to write this one down but my site needs a good version. How else are we going to keep warm this winter? 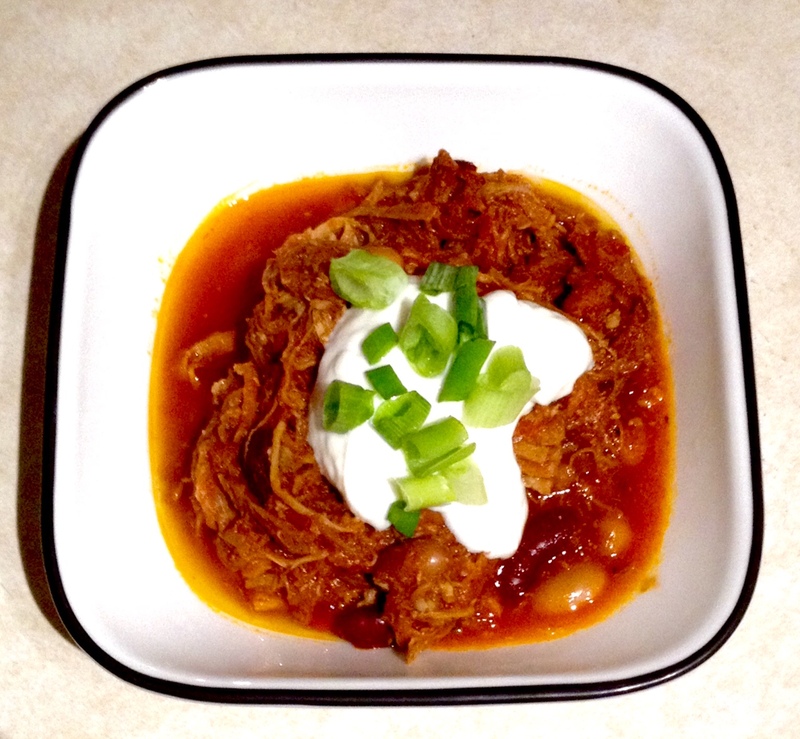 This pulled pork chili is a little more complicated than most because you have to slow cook the pork roast first and then simmer the chili altogether. Just think about how tender and juicy pulled pork is after simmering in the crock pot all day. Now imagine that the already tender pork gets cooked for another day in a saucy chili bath. In other words, it’s worth the trouble. Pour the liquids in the bottom of the crock pot. Lay the roast inside and sprinkle with the sugar and seasonings. Cook on low for 8 hours. Once cooked, Pull out the roast and let it cool. Reserve the liquid from the crock pot. Once the roast is cool, shred it. Add the shredded roast back into the crockpot. Add the beans, crushed tomatoes, tomato sauce, barbecue sauce, onion and garlic. Stir together. Add the reserved liquid from the pork as needed, depending on how soupy you want the chili. At this point, I marinated the mixture in the fridge overnight. Then I pulled it out in the morning and put it back on to cook on low for 8 more hours. Once cooked, season with hot sauce and salt to taste.